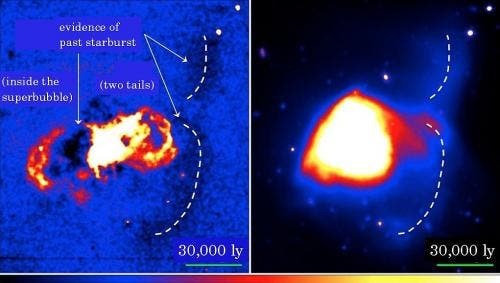 A team of astronomers from Japan has concluded that the ultraluminous infrared galaxy (ULIRG) Arp 220 developed from a multiple merger among four or more galaxies. Their new imaging data from the Subaru Telescope and optical spectroscopy from the W. M. Keck Observatory revealed two tidal tails that facilitated their analysis of Arp 220's development. Because Arp 220 is an archetypal or representative of an ultraluminous infrared galaxy. First discovered from the Infrared Astronomical Satellite's (IRAS) all-sky survey in the mid-1980s, ULIRGs are the most luminous class of galaxies in the relatively near or local Universe. Most of their energy output is in the infrared, suggesting that they contain a large amount of dust, an indication of immense star formation. Astronomers have proposed different scenarios for the development of ULIRGs. Since ULIRGs' huge infrared luminosities (1012 Lsun), powered mostly by a large number of massive stars, are comparable to the high luminosity of quasars, the brightest class of active galactic nuclei, a 1988 scenario proposed that ULIRGs were an intermediate phase in the evolution of quasars after a merger. Another scenario proposed by Yoshiaki Taniguchi of Ehime University and his associate in 1998 hypothesized that multiple mergers among several galaxies explained the observational properties. However, a number of questions remained unanswered: 1) How many galaxies were merged into one? and 2) Which types of galaxies were merged into one? Since then, explanations for the origins of ULIRGs have remained controversial. The current team conducted research to help answer these questions and to propose a plausible, data-based explanation for the origin of ULIRGs. 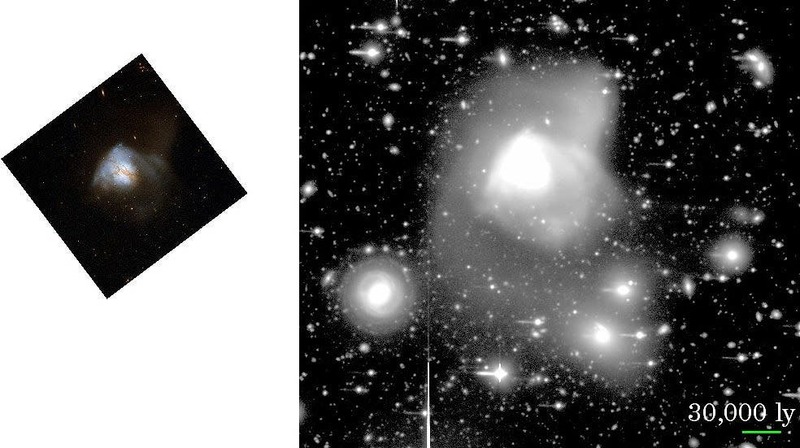 The team made detailed optical imaging observations of Arp 220 using FOCAS (Faint Object Camera and Spectrograph) on the Subaru Telescope and the LRIS (Low Resolution Imaging Spectometer) on the Keck II Telescope. The new imaging data revealed a spectacular pair of tidal tails extending more than 50,000 light years. Intermediate-mass stars (with masses a few to several times that of the Sun), the remains of intense star formation events called "starbursts", dominate the composition of the tidal tails. The presence of an Hα absorption line led to the first detection of these features. "I was very surprised when I found these Hα absorption features in the two tidal tails," said Dr. Kazuya Matsubayashi. A merger between two galaxies is necessary to cause a starburst in a merging system. Therefore, two post-starburst galaxies could have produced the two long tidal tails. However, four galaxies are needed to generate the two post-starburst galaxies. The post-starburst tidal tails revealed by the new observations suggest a new scenario for the merging history in Arp 220. The team suggests that the two observed tidal tails in Arp 220 need a merger between two advanced (i.e., post-starburst) merger remnants. In sum, four spiral galaxies are necessary to explain the observed post-starburst tidal tails in Arp 220. They conclude that Arp 220 comes from a multiple merger that includes at least four galaxies, not from a typical merger. The team thinks that this conclusion about Arp 220 can be applied to other galaxy groups. There are a significant number of compact groups of galaxies in the Universe that could lead to multiple mergers. Taniguchi noted, "Some of such compact groups have already merged into one. They are the ULIRGs observed to date." Some galaxies are associated together in a single gravitationally-bound group, and they will inevitably merge into one galaxy within several billion years. Although ULIRGs are thought to evolve into quasars and then into giant early-type galaxies, future considerations of the evolution of galaxies will need to take into account the impact of multiple mergers, not just major mergers between two galaxies. "Very recently, NASA announced that our Milky Way Galaxy will merge with the Andromeda Galaxy (M31) into a giant elliptical galaxy within several billion years," said Taniguchi. "Please don't worry. That would only be a merger between two galaxies, so our Milky Way will not evolve into a ULIRG." The image above of Arp 220 is from the Hubble Space Telescope’s Advanced Camera for Surveys (ACS). (Credit: Hubble Space Telescope) Right: Image from the Subaru Prime Focus Camera (Suprime-Cam). Huge, complex tidal remnants surround Arp 220. The image below shows Images of Arp 220. Left: Hα image taken with the Faint Object Camera and Spectrograph (FOCAS) mounted on the Subaru Telescope. The dark parts in the figure (Hα absorption) pointed out with arrows are three post-starburst regions. Right: For reference, an R band image from Suprime-Cam.